I wrote a series of guides about basic configuration of MDT and how you could customise the Start Menu, and with some further trickery, the Taskbar. I was never particularly happy with that section as it involved using a script to edit the registry after a user had logged in for the first time. Which, when talking about automation or consistency leaves a bit to be desired. Recently I have fielded a few support calls where Windows 10 users have received a new device and started using Windows Mail, instead of Outlook even though that was installed and configured on their machines. The problem here is that Windows Mail is on the taskbar by default, as well as being on the Start Menu with a nice live tile saying ‘use me for your email’. There is a lot of documentation around on the issue, but i have solved this by using the LayoutModification.xml file mentioned in the link above, which, following Windows 10 1607 (yes i am slow in finding this out) also supports Taskbar customisation. So, how do we do this? Well we still need to customise our Start Menu the way we want it, then use the Export-StartLayout command. This gives us a basic LayoutModification.xml file to start with. To that XML file we add a new section, that contains our Taskbar customisation. This should be placed inside the Section of your XML file. 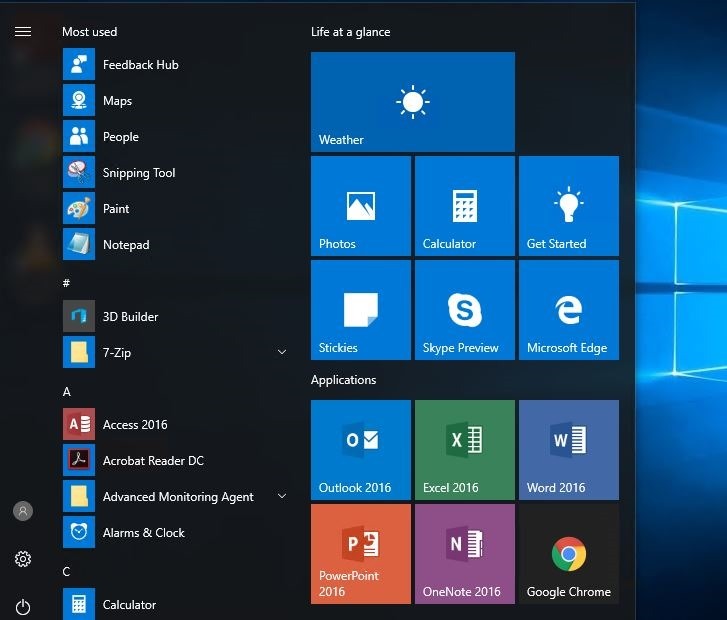 Adding applications is as easy as adding a new line and pointing the DesktopApplicationLinkPath to the Start Menu shortcut lnk, but remember to make sure the application exists on the target PC or the user will have no icon, or, on the Start Menu, an empty space. The above example replaces the default icons with Edge, File Explorer, Google Chrome, Excel, Outlook, Word, PowerPoint and OneNote. Edit – Image only as WordPress has chewed up the XML Code. Once you have edited your XML file, you need to place it in c:\users\default\local\appdata\microsoft\windows\shell replacing any existing LayoutModification.xml file. The next time a user logs on for the first time, their start menu and Taskbar will be built using this file. This will not affect existing user profiles on the computer. Using this technique you can remove the default shortcuts to Windows Mail, and the Microsoft App Store without having to fully remove the apps from the computer. How do you get that LayoutModification.xml file out onto your computers? Well you have many different options here of course, either add it in as part of your MDT build, or, use a GPO to add that file to any domain joined computer. If you use Group Policy Preferences to copy the file to the PC, rather than using the Policy option to specify a layout file, the user will still have the ability to change the layout. Why not go one further and then set a GPO to assign a Default File Associations file, to set the users default browser, default mail client and PDF viewer? On your deployment PC customise the default applications as you want them, then use DISM to export those settings to an XML file. You can then use another GPO to import those settings, or again add that into your MDT build.